But wait, there’s more! 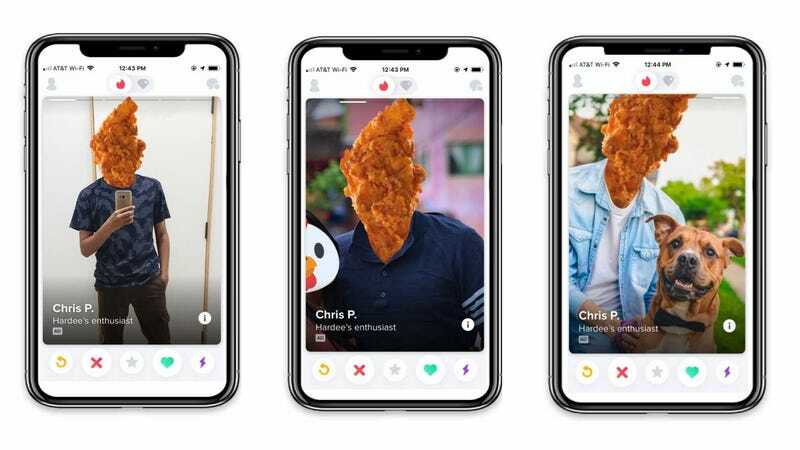 The character with whom you are hoping to match is named Chris P.—get it, crispy?—a moniker that caused The Takeout staff to sigh “oh my god” in unison in our morning meeting. His profile, featuring the classic mirror selfie and requisite dog photo, describes him as “super tender and 100% Real! Looking for someone with a healthy appetite for fun.” His interests? “Travelling, Podcasts, NetChix [sic] and chill.” Ughhhhhhhhhhh guyyyyyyyyys. What if you’d recently joined Tinder after a rough breakup? You’re tentatively dipping your toes into the terrifying app dating waters, but you’re mostly striking out with matches until—what’s this? a match!—except it’s Chris P., the imaginary mascot for Hardee’s. That’s crushing. I’m not sure I can bear to write about this any longer so let’s cut to the chase—this promotion starts tomorrow; I can’t believe that in 2018 we’d subject ourselves to this level of brand-promoted indignity in exchange for BOGO fast-food chicken; this has inspired me to consider deleting my entire digital presence.